Thanks to its ravine and river systems, TORONTO has become the raccoon capital of North America – a hot spot for garbage can foodies. They live well. According to CBC’s “Nature of Things”, our raccoons are so fat that sometimes they walk by food as if to say “No thanks, I’m stuffed.” Country raccoons live a shorter life than the average three-to-five years enjoyed by city dwellers. Despite the stresses and strains of big city life, TORONTO’s raccoons like living with us. 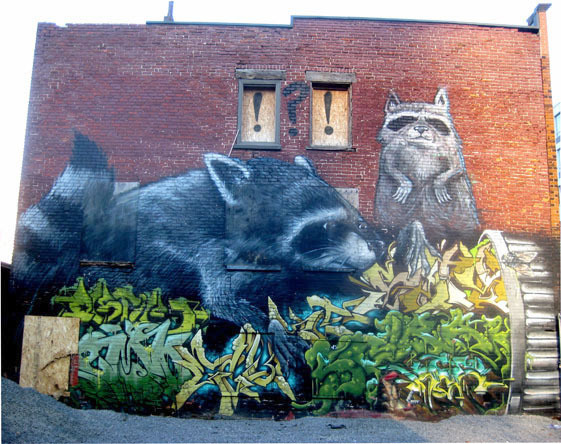 This entry was posted in Neighbourhoods and tagged Canada, Ontario, raccoons in Toronto, Toronto, Toronto's Raccoon Nation. Bookmark the permalink.